House of Marley is a company built on the premise of high quality products which are also environmentally friendly and don’t leave a huge carbon footprint. Their use of sustainable materials wins them lots of awards, and for good reason. When it comes to aesthetic design, turntables in the sub-$300 price range can be a fairly variable proposition. Whilst some manufacturers take a step back from innovating in terms of the visual appeal and functionality of their devices in favor of maxing out the audio quality, Marley has taken a very different approach. To put it bluntly, the Stir It Up turntable is, by some margin, the best looking turntable we’ve seen in this or any price range. It’s a truly gorgeous, versatile device. Marley describes the design as ‘streamlined’, and that seems a fair description. It’s gorgeously minimalistic, with absolutely no clutter and with every inch of space used to its fullest potential. The finish is a natural bamboo which creates a very modern, very warm aesthetic that will lighten up any room it plays a part in. For the price, the audio hardware is going to give you a lot of bang for your buck. The Stir It Up is by no means just a pretty face, and the system comes packaged with an upgradeable Audio Technica MM cartridge, a built in preamp, and a recyclable aluminium tonearm. You’ll also find USB connectivity which allows you to convert your vinyls to a digital format which is a feature we always like to see included where possible. A 3.5mm headphone jack on the front blends seamlessly into the front panel and allows solo playback should the mood strike you. And you’ll also find anti-skating controls to mitigate excess distortion. All in all, this is an extremely solid set of features for a turntable at this price point, and very much demonstrates Marley’s dedication to entering this new market. Continuing the eco friendly vibe, the four feet of the device which serve to absorb excess vibration are fashioned from recycled rubber whilst the bottom is finished with upcycled fabric comprises of hemp, organic cotton, and recycled plastic bottles. If the climate is something you’re concerned about (and if it isn’t, what’s even wrong with you), then the carbon footprint of this device should help you to sleep a lot easier than that of most other consumer electronic products. All of this eco friendliness, gorgeous design, and delightful packaging (which we haven’t mentioned but, trust us, is just lovely) is great and all, but it doesn’t count for much if the turntable can’t deliver a solid audio performance, right? Well, worry not. It manages to do just that. It’s worth pointing out in case it wasn’t obvious that this device does not include any internal speakers which competing products sometimes do, and so be aware that you will need a solid pair of speakers to hook this turntable into to produce the full effect. In our tests, we hooked it up to our standard pair of speakers and found that the Stir It Up did a great job with pretty much everything we threw at it. The anti-skating measures did their job entirely well, and we didn’t experience any noticeable skipping, distortion, or noise during our tests. The sound was warm, rich, and pleasant across the board. 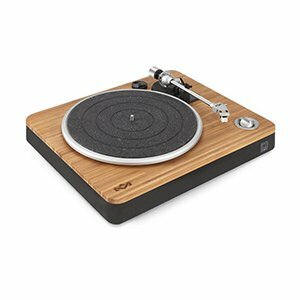 A thoroughly gorgeous looking device which will appeal to the environmentally conscious and those who are just fans of good design alike, the Stir It Up turntable also manages to deliver where it really matters with great a audio performance.